It seems the E Mail ID of RWABhagidari blog has been hacked. Unable to open the in.com ID even after changing the password. There may be some technical problem with in.com or it seems that the E mail ID vohrabs@in.com has been hacked. 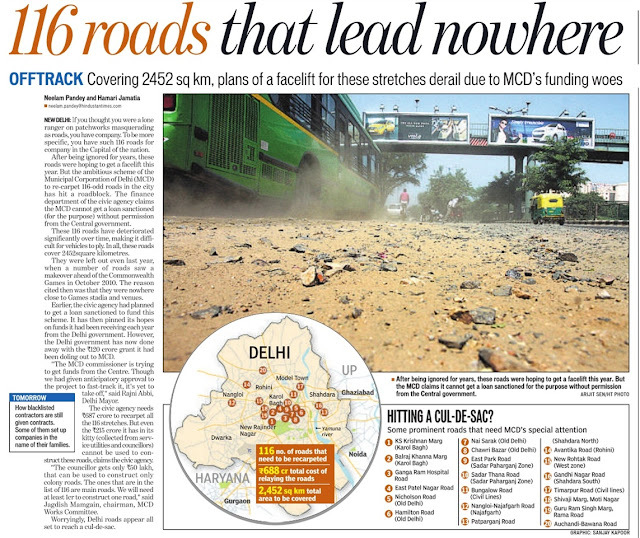 There is a shocking game being played amongst the RWAs of Delhi. Some are being termed as the Pro CM whereas others Pro BJP. "Just can't understand, how an RWA can be dedicated towards any political affiliation", says B S Vohra, President, East Delhi RWAs Joint Front.. The purpose of forming an RWA is to serve the society by using what ever sources available. The elected representatives may be of any political party, RWA has to get the work done from those sources. But. now an effort is ON to DIVIDE the RWAs on the political ground making them vulnerable in the eyes of General Public. " We must try our best to stop this nuisanse & remain united to achieve our goals", says B S Vohra. Message from Yahoo ! Team : JUST A FRAUD. PLZ DONT CLICK TO THE REQUIRED LINK OR YOUR Mail ID WILL BE HACKED. This is to inform you that Yahoo! is shutting down some accounts due to congestion. This notification has been sent regardless of your last login date and you are required to access your account by clicking the link below to confirm usage and enjoy uninterrupted services. The Account Update Team at Y! thanks you for being on the network and apologise for any inconvenience caused. This service message was delivered to you as a Yahoo! customer to provide you with account updates and information about your account benefits. Y! values your privacy and your preferences. Copyright © 2011 Yahoo! Inc. All rights reserved Copyright/IP Policy | Terms of Service. We are launching very soon a MEGA RWA OF DELHI i.e. " 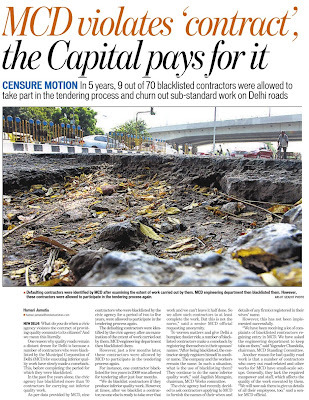 VOICE OF DELHI ". The RWA personalities from various parts of DELHI and willing to join us are requested to contact as soon as possible with complete contact details by an E MAIL to become a member. We invite you to witness the display of Ricoh Brand Machines exhibition at Himachal Bhawan, Mandi House, NEW DELHI. This gives you a wonderful opportunity to interact with our team members personally and know more about Ricoh Brand Machines. We look forward to your presence in the exhibition onSeptember 29th and 30th at Conference Hall, 1st Floor, from 10.00am to 5.30pm. with thanks : HT : link above. Power Tariff Hike ...... Is it Justified? ........ A Public Debate ......... the way forward. The power tariff protest is becoming more of a political stand point between social and political groups. Far from a Reasoned Debate, it is turning out to be a political akhara ...... the loser will be the cause and aam aadmi. You may have noticed that in a recent meeting with CM, RWAs were told that the issue of Power Tariff has been settled with the request of a CAG Audit. The CM thinks that the fight now is Political because URJA is BJPs B Team and other voices are from areas represented by adversaries from within the Congress Party. This my friends is an unfair evaluation of the situation and unfortunately people close to the CM have not been able to inform her of the actual ground situation. We as a cohesive group that went before DERC collectively never discussed the matter with our area MP, MLA or Councillor ...... we got together and worked for a cause and shared our resources. All through the DERC Public Hearings there were other individuals and RWAs from specific areas and not representing any group as such. 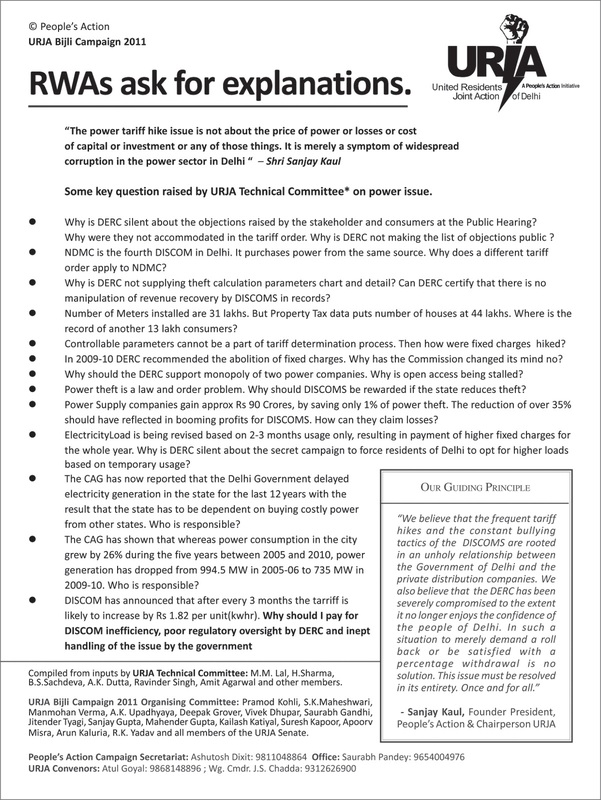 We as a group managed to put up informed well reasoned and researched objections/ suggestions ..... media also widely published reports of daily hearings ...... till the DISCOMS woke up and hired their Spin Doctors to divert the swelling tide. We fully understand how PR companies divert a tide ....... just introduce another set of tides ....... remember Aruna Roy .... during Anna time ....... this is an age old strategy and their are many takers / pretenders willing to ride the tide. It's sad, if only there were this many people during Public Hearings , the picture would have been different. What is the way forward ....... we have all agreed that we are Apolitical but not averse to political parties / entities support. We also do not wish to form an umbrella group that can be hijacked. With this background we cannot also allow shortcomings of other groups to harm the cause, because of above stated reasons. I have spoken to all over the phone except a few, if before finishing this mail I get to speak to them fine otherwise they will understand after reading this mail. Organise a Public Debate ........ Titled ...... Power Tariff Hike ...... Is it Justified? 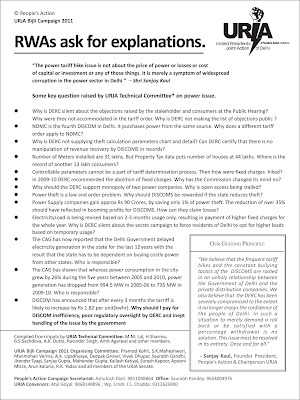 An informed debate is the need of the hour ....... we are willing to pay fair value for the power we consume ..... but who determines Fair Value ...... and how is it to be determined ....... that's the debate ...... Open to all RWAs, Social Groups , DISCOMS, Govt. Reps., Independent Experts even Politicians of all hues are welcome. We must drop our affiliations and unite for a cause that will eventually impact every citizen of Delhi. I on behalf of our group wish to state, that we are willing to present all that we placed before DERC on the four Grounds ie. Logical, Technical, Legal and Criminal in any open Debate. This debate can be conducted at any central place ...... like Constitution Club or IHC or IIC or some hall like the one in Scope Complex. We have been approached by Mr. Vijay Goel, representing Lok Abhiyaan (NGO) involved in many social activities and has expressed his desire to associate with us as NGO to espouse this cause. He is willing to organise one such moderated debate with us on one side placing the Public Cause and DISCOMS on the other for an informed debate and other Public Awareness Programmes supporting the cause. It has been explained to Mr. Vijay Goel that our association is Apolitical in true Anna style where anyone in their individual capacity is welcome to support the cause. This is to place the facts on Record. You may be aware of the recent order of the DERC providing for a 22% hike in power tariffs for this fiscal. This hike was given effect under seriously compromised conditions, and in the shadow of an earlier order of the DERC which suggested 20% reduction in tariff, which was then truncated by the intervention of the Delhi Government, in an attempt which was found to be grossly illegal in Court. Naturally, there is more to it than meets the eye, as we have all been suspecting for long. We placed before the court our doubts of the veracity of the accounts on the basis of which the DERC bases its tariff order. When the Court asked if the DERC has any third party audit mechanism to confirm the accounts of the DISCOMS, the Commission answered in the negative. The court has since taken cognizance of our plea and issued notices to the Government, the DERC and DISCOMS on our petition for a CAG audit of their accounts. Now, the Government has started murmuring that an audit might not be out of place. In which case, we have said, it stands to reason that the hike should be deferred or held in abeyance until the audit is complete. And that is where the Government is dragging its feet. And that is what we don’t accept. We have also invited elected representatives of all political parties to join us to express their solidarity on the issue. We would like to have you join us with your support groups to lend support to this campaign. Please walk in anytime staring 10 a.m. on Sunday. Do bring supporters, friends and family and anyone else who pays an electricity bill. Bade Hospitals kee to baat hi aur hai. अनर्थशास्त्र: 32 रुपये में गुजारा करने वाला गरीब नहीं! We are pleased to inform that now we have a substantial number of RWAs, as the SUBSCRIBERS of this Blog, and that too, from almost every part of Delhi. On the continuous requests by many of these subscriber RWAs, we have decided to launch a MEGA RWA OF DELHI i.e. "VOICE OF DELHI". The RWAs willing to join us are requested to contact us, as soon as possible with complete structural details by an E MAIL to become a member of "VOICE OF DELHI". The scope of this blog was also extended & now onwards, we will upload the civic problems being faced by the RWAs covering Entire Delhi & NCR. Therefore, please feel free to mail us your civic issues with pics & vids but with your complete contact details. New Delhi, Sept 19 (PTI) The resident welfare associations in the capital want the power distribution companies (discoms) to be brought under the RTI and their accounts be audited by the CAG.In a letter to the Delhi Chief Minister and the Chairman of Delhi Electricity Regulatory Commission (DERC), People's Action -- a body of RWAs -- has also demanded review of the objections filed by consumers with the DERC during the public hearing and reopening of the PAC report submitted in the last term of this government.The group, in a letter to Chief Minister Sheila Dikshit, said, "The discoms have enjoyed unprecedented and illegal protection from public scrutiny by being kept outside the ambit of RTI since inception." Calling it a travesty, the body said Delhi government, being a 49 per cent stakeholder, should pressurise its partner discoms to immediately withdraw their plea in the court which had stayed bringing them under RTI.The advocacy group held a mahapanchayat of RWAs at the Jantar Mantar on Saturday during which People's Action Founder and chairperson URJA Sanjay Kaul listed four demands.In the separate letter to DERC Chairman, the RWAs said that the CAG should audit of the accounts of the discoms before any hike.On the point of the CAG audit, they noted that DERC has shown some willingness to accept the demand after the High Court has issued it notices. "As is inbuilt into the nature of accounting practises, a tariff hike can only be effected after the audit is completed and not before and request the DERC to find means and methods of holding the order in abeyance until then," the letter said.The body said that since the public hearing was a necessary ingredient in the tariff fixation process, the objections of the consumers had to be acted upon and not merely heard and dispensed with.They said that the DERC would be failing in its duty if "it didn't immediately constitute a committee to view the objections so filed and if these were not discussed threadbare with representatives from the RWA body. "People's Action has formed a committee made up of experts, techno-legal experts and RWA members to enter into discussions with the DERC on this point," they said. with thanks : link above. Our RWA situated in South Delhi. We need your immediate help for stopping the illegal construction in the colony. We had repeatedly written complaint to public authorities. But no action has taken far. Builder is constructing 18 numbers of flats in 300 square yards with collousion of the public authorities. Hope, you shall guide us how to stop/seal the ongoing illegal construction in our colony. THE FUNDS ALLOTTED FOR THE DEVELOPMENT OF AREA ARE BEING SURRENDRED EVEY YEAR. IT IS FACT THAT NONE OF MLA IS KEEN IN DEVELOPMENT IN THIER AREA. THEY HAVE ALWAYS COMPLAINT THAT RESIDENTS OF RWA ARE NOT COMING TO THEM AND THEY ARE NOT AWARE OF THE PROMBLES OF THE AREA. WHERE AS THE FACT IS THAT ALL THE RWAS HAS GIVEN THEIR WORKS AND COMPLAITS TO THEM PERSONALLY MANY TIME BUT THE MLA HAS NOT TIME TO SEE THEM AT ALL. THEREFORE, THE FUNDS ALLOTTED FOR THE DEVELOPMENT OF AREA ARE BEING SURRENDRED EVEY YEAR. WE THE RWA HAS A SUGGESTION THAT ACCORDING TO THE LENGTH AND WIRTH OF TH AREA AND PUPULATION THE PORTION OF THE FUND MAY BE TRANSFERED /DIVERED TO THE EACH RWA's bank account SO THATEACH RWAS MAY TAKE UP THIER WORK IN TIME. 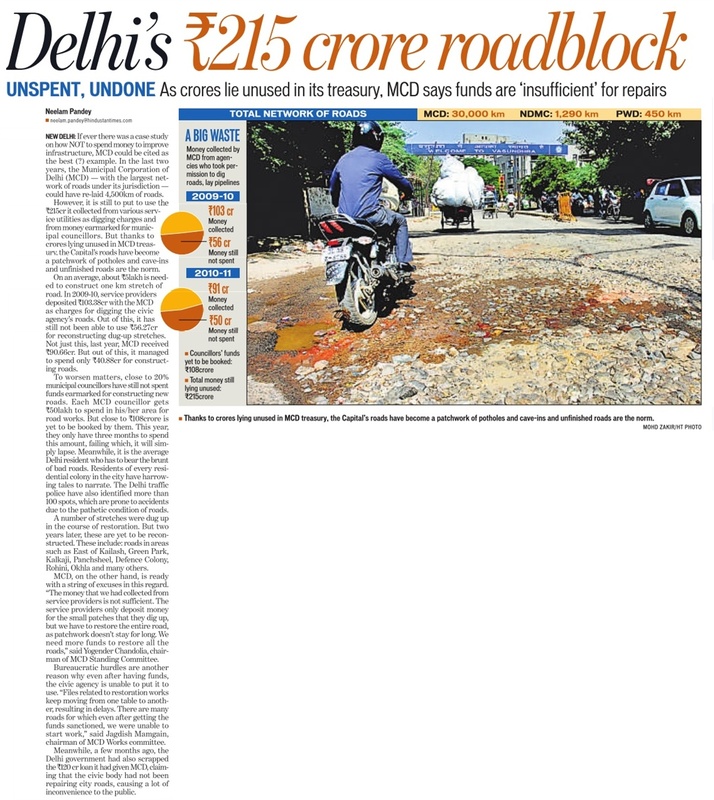 SOME TIMES, THE CHAMCHAS OF MLA GETTING THE WHOLE FUNDS FOR THEIR AREA WITHIN ONE WARD ONLY. TO AVOID SUCH SITUATION FUNDS OF MLAS SHOULD BE EQUALLY DIVIDED AMONGEST THE EACH RWA. SL Watwani & Dhruv Watwani on Inflation. A meeting of various RWAs with Chief Minister Mrs.Shiela Dikshit was held at Delhi Secretariat, today i.e. Saturday, the 17th Sept 2011. A Good number of Ministers, MLAs as well DJB persons were present in the meeting. A good number of RWAs from almost every zone were present there. CM informed in the very begining that the Power issue was over as Govt had agreed for CAG Audit of Power Firms & therefore, issues related to DJB were asked from RWAs. Mr Pankaj Agarwal, welcomed all & informed to CM & house that there is very heavy resentment amongst the RWAs & residents due to power & water tariff hikes. RWAs raised the issue of DJB's orders on revision of water rates, as it was not consumer friendly & tariff needed to be rolled back. RWAs raised the issue of 60% Sewer charge & 10% hike on water bills every year as it was not acceptable. RWAs raised the issue of over flowing of Sewers in various areas & not being looked after. RWAs raised the issue of Mechanical Vehicals for cleaning the sewer which is not adequate & asked for two vehicles per Ward. 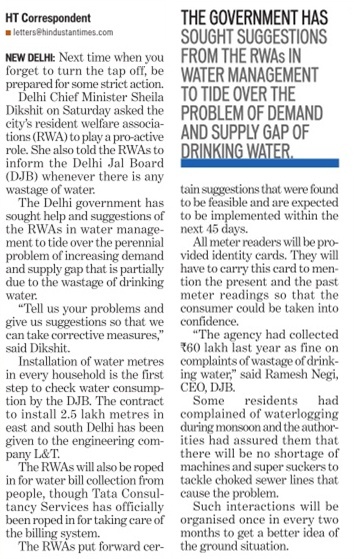 RWAs raised the issue of Faulty Meters & DJB officials in meeting confirmed that even ISI meters get defective in no time of their installation. Meters changing should be the responsibility of DJB. Mr B S Vohra, President, East Delhi RWAs Joint Front ( A federation of RWAs of Delhi East), raised the issue of heavy water logging in Krishna nagar, Lal quarter, Geeta colony areas. Mr Sandeep Kapoor asked for the small vehicals with mechanical devices for cleaning the sewers for the area to control water logging. Mr K K Ghei asked about the faulty sewer system in Madhuban & adjoining areas. Many RWA representatives raised the local issues related to DJB & Sewers. 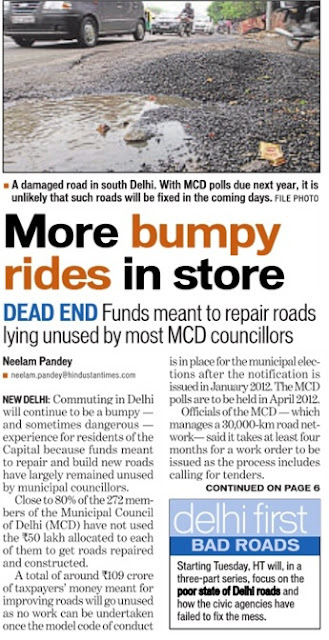 It was informed by Mr Ramesh Negi that now onwards the meters will be changed by DJB. CM mentioned that she is thankful to RWAs for bringing these points to her notice & DJB CEO will look into these & shortly residents will find improvements in the DJB services. Re: CAG Audit of Power Firms : OCCASIONALLY ????? CAG Audit of Power Firms : OCCASIONALLY ????? For the Attention of all the RWAs ! "TIME BOUND DELIVERY OF SERVICES TO CITIZEN"